Burn belly fat and lose inches with delicious dishes that will get you swimsuit-ready but won't leave you hungry. Choose from the meals and snacks on these pages for a total of 1,500 calories a day. Combine this diet with our workout and you'll drop 10 pounds in one month. Whisk together 2 eggs; set aside. Coat a frying pan with nonstick cooking spray and saute 3/4 cup chopped broccoli florets 2 minutes; add eggs and scramble. Once eggs are cooked, sprinkle with 1 1/2 tablespoons grated Parmesan. Serve with a slice of whole wheat toast. Mix together 1/2 cup each cucumber, chopped tomato, and red and green pepper. Add 1/2 cup chickpeas, rinsed and drained; 5 Kalamata olives, pitted and sliced; and 1/4 red onion, thinly sliced. Toss with 2 tablespoons red wine vinegar and 1/2 tablespoon olive oil. Sprinkle with 2 tablespoons crumbled reduced-fat feta. Saute 1 teaspoon each minced garlic and ginger in 2 teaspoons sesame oil. Add 1/4 pound shrimp, shelled and cleaned; saute 1 minute per side and remove from pan. Add 1/4 cup sliced shiitake mushrooms and 1/4 cup chopped carrots to pan; cook 5 minutes. Add 1/4 red pepper, sliced; 1/2 cup chopped bok choy; 1/4 cup hoisin sauce, and the shrimp. Cook until heated through. Serve over 3/4 cup brown rice. Snack: Puree 1 cup melon with 1 teaspoon lime juice and freeze. Serve over 3/4 cup raspberries and 1/2 cup blueberries. 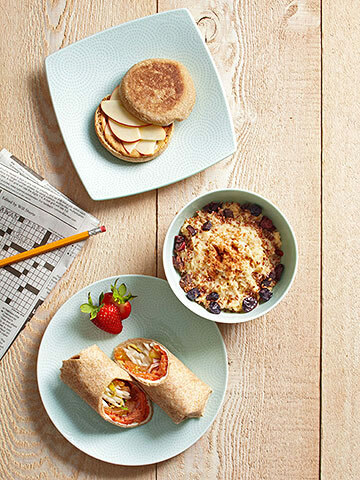 Each healthy breakfast recipe is about 300 calories. Toast a whole wheat English muffin. On half, spread 1 tablespoon almond butter and top with 1/2 apple, thinly sliced, and a sprinkle of cinnamon; cover with the remaining muffin half. Bring 1 cup apple cider to a boil. Add 1/2 cup oats; cook 5 minutes. Sprinkle with 1/2 teaspoon cinnamon, 1 tablespoon chopped dried fruit (such as cherries or cranberries), and 1 tablespoon flaxseeds. Spread 1 1/2 tablespoons low-fat cream cheese on an 8-inch whole wheat wrap. Top with 3 ounces smoked salmon, 2 slices tomato, 2 slices red onion, and a handful of sprouts. Roll up. Peel 1 medium banana; halve lengthwise. Spread 1 tablespoon natural peanut butter on one half; sprinkle with 1 tablespoon wheat germ. Top with other half and slice into rounds. Place 1/4 cup nonfat Greek yogurt in a bowl; top with banana slices and a drizzle of honey. Preheat oven to 450 degrees. Halve 2 to 3 ripe apricots; place in a glass baking dish, cover with foil and roast 20 minutes. (Apricots can be roasted the night before.) Mix 1 cup nonfat Greek yogurt with 2 tablespoons slivered almonds and a drizzle of honey. Top with apricots. Each healthy lunch recipe is about 400 calories. Mist a pan with nonstick spray; saute 1/2 cup sliced zucchini 3 to 4 minutes. Toast a whole-grain flatbread; top with 1 ounce shredded mozzarella, zucchini, 1/2 cup diced tomato, and 2 tablespoons pesto. Season to taste with red pepper flakes. Broil on low until cheese is melted. Mash 1/2 avocado; season to taste with lemon juice, salt and black pepper. Spread on a slice of whole-grain bread and top with 3 ounces smoked turkey, 2 tablespoons salsa, and another slice of bread. Serve with 1/2 cup red grapes. Toss together 1/2 cup shredded cooked chicken breast; 1/2 cup baby greens; 1/4 cup shredded carrots; 1/4 cup green beans, cut into bite-size pieces; 1/4 cup chopped cucumber; and 1/2 cup cooked quinoa. In a bowl, combine 1 tablespoon olive oil, 3/4 teaspoon chopped dill, 1 tablespoon white vinegar, a pinch of sugar, and salt and black pepper to taste. Drizzle dressing over salad. Mix together 2/3 cup canned corn; 1/2 cup chopped tomato; 1/2 cup chickpeas, rinsed and drained; 1 tablespoon chopped red onion; and 2 tablespoons each chopped fresh basil and oregano. Add 3 ounces drained chunk light tuna. Season with salt and pepper; toss with 2 tablespoons light balsamic vinaigrette. Each healthy dinner recipe is about 500 calories. Saute 1 small chopped onion and 2 minced garlic cloves in 1 teaspoon canola oil. Add 1 quart chicken stock; 1 peeled, cubed sweet potato; 1 cubed potato (skin on); and 1 can diced tomatoes. Add 1 teaspoon each ground cinnamon, cumin, curry powder, and sea salt. Mix in 1/4 teaspoon cayenne and 1/4 cup chunky peanut butter. Simmer 10 to 12 minutes. (Makes 3 servings.) 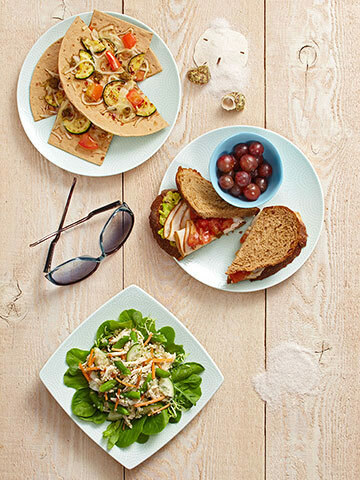 Serve with a whole wheat roll spread with 1 teaspoon butter and a garden salad sprinkled with 2 teaspoons sunflower seeds and 1 tablespoon vinaigrette. Microwave 1 medium potato. Top with 1/4 cup canned black beans, rinsed and drained; 1/2 cup diced cooked chicken; 3 tablespoons shredded cheese; 2 tablespoons salsa; and 1 cup steamed broccoli. Dollop with 2 tablespoons nonfat Greek yogurt. Marinate one 4-ounce salmon fillet in an Asian marinade, such as Soy Vay, for 15 minutes. Remove from marinade; bake 20 to 25 minutes at 350 degrees. Mix together 1 tablespoon sesame oil, 1/2 cup rice wine vinegar, 2 teaspoons sugar, and 1 teaspoon salt; toss with 3 cups chopped cabbage, 1 teaspoon toasted sesame seeds, and 1 tablespoon toasted sliced almonds. 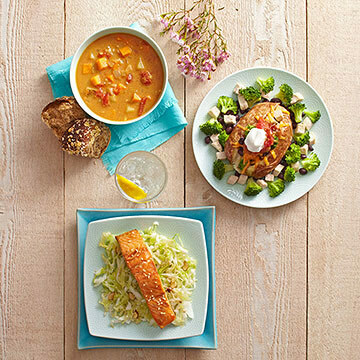 Serve salmon with slaw on the side. Blanch 1/2 cup chopped carrots in salted boiling water 3 minutes, adding 1/2 cup snow peas for last minute; drain. Saute 2 tablespoons chopped onion, 1 minced garlic clove, and 2 teaspoons grated ginger in 1 teaspoon sesame oil for 1 minute. Add 4 ounces cubed pork loin; saute 4 to 5 minutes. Add 1 cup cooked brown rice and saute 2 minutes. Add 1 tablespoon soy sauce, cooked carrots and snow peas, and 1/4 cup sliced scallions. Saute 2 minced garlic cloves in 1 tablespoon olive oil. Strain and reserve half the liquid from a small can of clams. Add half the clams to pan; saute 1 to 2 minutes. Add 2 chopped and seeded tomatoes, 1/8 teaspoon red pepper flakes, 1/4 cup dry white wine, and reserved clam juice; cook 7 to 8 minutes. Add 1 cup cooked linguini and 1 cup spinach. Each snack is about 150 calories; eat two a day. 1 small cored apple filled with 1 teaspoon each chopped walnuts, raisins, and dried cranberries and a dash of cinnamon and baked in foil at 425 degrees for 12 to 15 minutes.